I love your writing! I’m following your blog, and can’t wait to hear more of your stories! Great post! I think you’d write a great book one day. I really like your quote about feeling “fortunate and lucky and tiny.” It’s a great juxtaposition and I think that feeling grateful or showing gratitude should always take into account those three words. Fortunate and lucky for all that we have, yet tiny to maintain our humility. I feel like there are thousands just like me and yet I also feel alone. – so true and relatable. I cannot understand how I can feel so deeply for this lost person and his/her family – this whole paragraph is especially relatable to me in that i tend to think too much and feel too much, especially when it comes to the tragedies of others. Thanks so much! It’s so important to “feel connected” and that someone gets you, and I so appreciate that you get me! 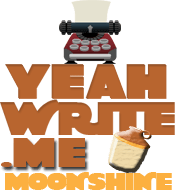 I got here from Yeah write’s moonshine grid. Wonderful writing, Carrie! And i love napoleon dynamite haha!